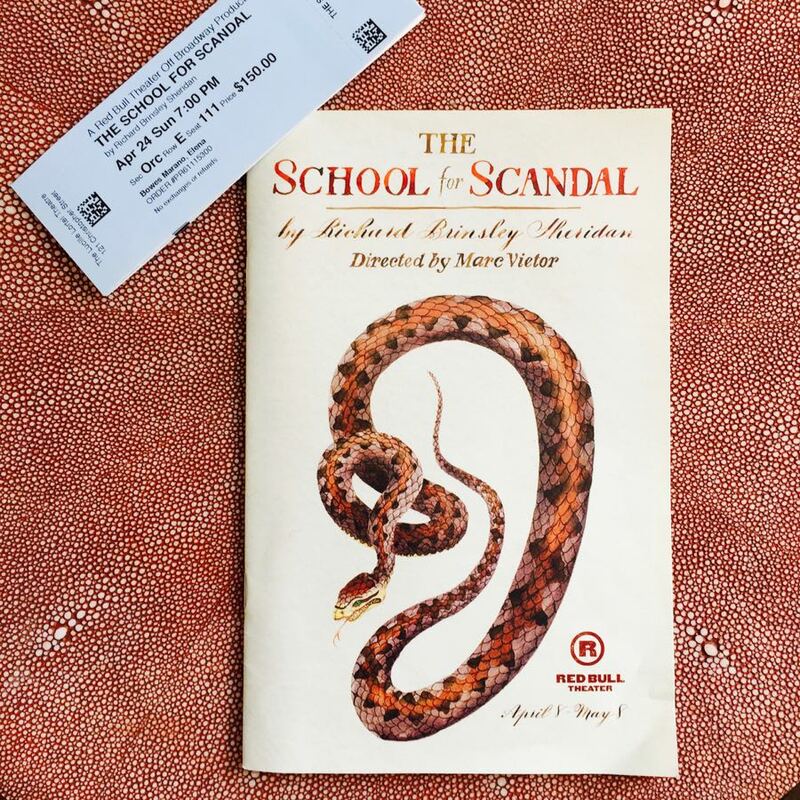 With characters named Lady Sneerwell, Sir Benjamin Backbite and Mr. Snake, I knew “School for Scandal” by Richard Brinsley Sheridan wasn’t exactly Chekhov. Comedy, the perfect choice for my friend Marc Vietor’s debut as a director. I can always fake laugh, I thought to myself. What’s two hours for an old friend? But low and behold, Marc is a natural director, no fake laughing required. Two hours well spent. Even my daughter Kate who equates theater with nap-time – unless it’s “Porgy & Bess” – loved the play. I think really camp theater is my thing, she concluded as we strolled out. Wasn’t Marc’s play hysterical? I said to my sister Diana. I can’t decide whether to blog it now or wait for the NYT’s review. Let them do the heavy lifting, advised my older and wiser sister. 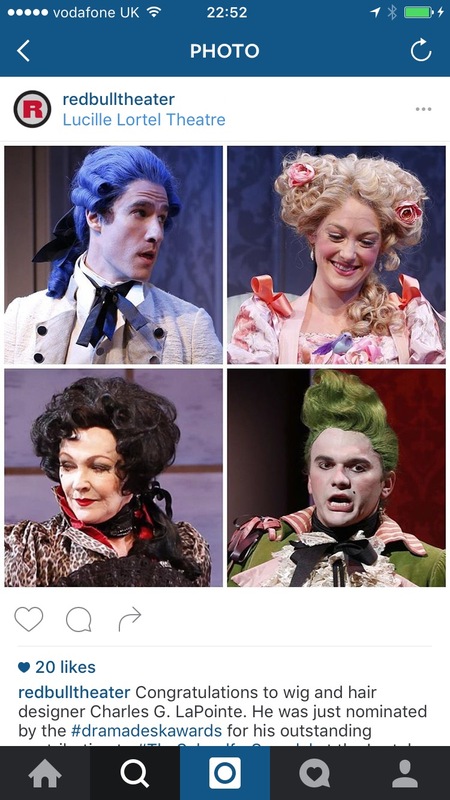 The main trouble, always, with Richard Brinsley Sheridan’s spirited satire “The School for Scandal” is that we don’t get enough of them. 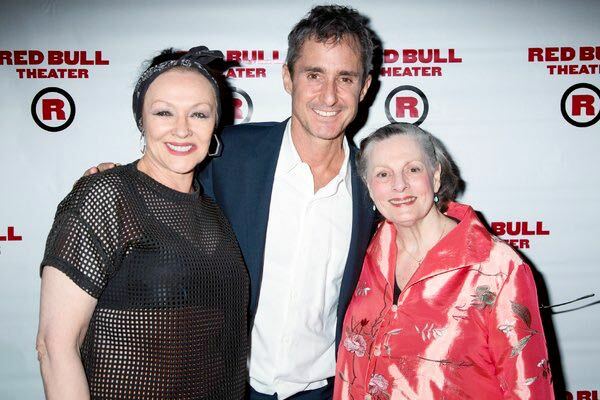 But they are played to such delicious perfection in Red Bull Theater’s jaunty new production, directed by Marc Vietor at the Lucille Lortel Theater, that I wish I could beg Sheridan for a spinoff. Frances Barber’s Lady Sneerwell, all acid words and narrowed gimlet eyes, is the ideal companion to Dana Ivey’s Mrs. Candour, who’s as innocent as a poisoned sweet. I confess, Mr. Surface,” Mrs. Candour says, addressing a young gentleman, “I cannot bear to hear people attacked behind their backs; by the bye, I hope ’tis not true that your brother Charles is absolutely ruined?” …..
It’s also been nominated for Best Revival by Off Broadway Alliance. We have had such good reviews that I have a feeling that even when (audiences) don’t think it’s funny, they laugh because everyone tells them it’s funny. It’s that whole group thing. You don’t want to be perceived as an idiot because you don’t think it’s funny yourself. and actor Ben Mehl takes his small part as 4 different servants and goes uproariously big. Sheridan’s play is as relevant today as when it first appeared on stage over two hundred years ago. What interests me about older plays, some people call it “museum theater, is the fact that human nature never changes,” Ivey told Theater Mania. Clever directorial touches include the sound of birds chirping in the background as viewers find their seats and the set’s Twitter-adorned wallpaper. The logo of the program can be seen as a snake or an ear. Marc slashed nearly three hours off of the original script which included five acts and intermissions. I cut the hell out of it. He rewrote several passages, replaced the boring butler Old Rolley with the exotic Master Ranji, replaced anti-Semitic Moses with money-lender Midas and cleverly dealt with zero wing space backstage. That’s why I used the same five pieces of furniture for the play because there’s no room to put them off stage.There’s no hidden stage. Dressing rooms are above the theater. The actors stay in character as they swiftly move the limited set around between scenes. And behind the scenes, Marc worked over-time. I had to talk everybody involved in this whole show, everybody from beginning to end I had to talk them into it, the set designer, the lighting designer, the guy who did the poster, the guy who did the program, I had to talk every single actor into doing the job, … every single dollar that’s in this show I had to scrape up from somebody. I’ve never done something like this before, and I’m never doing something like this again. Its nerve wracking and exhausting. This is it… a one-time experience. Now if someone comes along and sees it and decides they want to hire me as a director, I’ll do that in a minute. You heard it here readers – Terrific director for hire! And he’s great company too.